Just about any film will have its strengths and weaknesses, but some of these I never expected from veteran Spielberg. Its main strength lies in the acting. 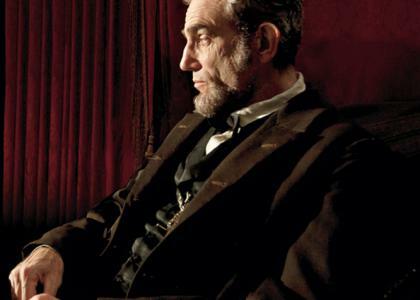 Daniel Day-Lewis is, unsurprisingly, fantastic as Abraham Lincoln. He humanizes the president that we are all too familiar with as a piece of money or a stone face on a mountain. He shuffles his long, lanky legs uncomfortably, hunches his too-tall shoulders and bears his unmistakable fatigue with grace. In some scenes it appeared that they gave him shirts with sleeves too short to make his hands and arms appear even longer. In school we learn about Lincoln’s achievements and consider him to be a great man, but I came away from this actually liking Lincoln, as a person. He was not without his faults, certainly, but he came by those faults honestly. Another of the strong performances comes from David Strathairn, which is again not a surprise. He is always a solid actor and he nails his role as Secretary Seward. He looks uncommonly comfortable in a vest, cravat and brushed forward hair, like he walked out of a painting in the National Portrait Gallery. Tommy Lee Jones clearly had way too much fun as the bombastic and insulting Thaddeus Stevens. He let fly as the unapologetic Congressman, and the head of the Ways and Mean committee. Indeed he steals every scene he is in, save one with Day-Lewis. Much has been made of Sally Field and her insistence on being cast as Mary Todd Lincoln. I don’t know who else had been considered but she does a fine job. Mary is a complicated character both in real life and in this film and she deals with it nicely. Smaller roles for James Spader and Lee Pace are also well-cast and well-acted. Now for the weaker points. If I had to put into one sentence: This film does not seem like it was directed by Steven Spielberg. Much of the camera work feels like a Ken Burns documentary. Painfully slow zooms don’t constitute cinematography in my opinion and this movie is full of them. There are occasional filmic string scenes but there are not enough. Additionally, there are rookie mistakes. For example, Lincoln and Grant sit on a porch after the South has surrendered. They talk about their ideas for Reconstruction. The shot is an exterior. The sunlight is apparent and coming from behind the actors. Yet there is very bright, very obvious light being shined on the actor’s faces. This is not just ambient light — this is spotlights and reflectors. In fact, it kind of makes the viewer’s brain hurt until you figure out what is going on. The writing is not strong either. The best parts is the tight dialogue during the debates, both in the cabinet room and on the senate floor. Unfortunately, much of the character dialogue is weak, or just passable. And as much as I like Joseph Gordon-Levitt, his “storyline” was completely unnecessary and poorly presented. He plays Robert, Lincoln’s eldest son who is insistent upon joining the Union forces. The family strain is clearly evident without this subplot and his scenes just pull the viewer away from the driving force of the movie. Time would have been better spent expanding the story on Gloria Reuben‘s character, Elizabeth Keckley. As unlikely as it sounds, it also seems like this film was the victim of the dreaded test audience. The film should have ended with a strong shot of Lincoln walking down the hallway at the White House in silhouette. The audience knows he is going to the theatre. It’s effective but subtle. Instead, we have to watch 10 more minutes of stilted dialogue and really cheesy effects. There is even a superimposition shot of a dead Lincoln in bed, surrounded by colleagues, over a gas lamp while they spout bad writing. Unfortunately, this film is really just a History Channel special for classrooms, with better acting and some better sets.